Transferring liquids from small drums, buckets and carboys using hand-operated, manual pumps can be a time-consuming and messy process, even if correct procedures are followed. An easier, safer and more efficient method is by using light and compact motor driven drum pumps like Finish Thompson EF Series drum pumps. Available through pumping specialists MICHAEL SMITH ENGINEERS the EF series of sealless drum pumps are acknowledged as being the most competitively priced and highest quality powered drum pumps in their class. They are ideal for light to medium duty, transferring oils, detergents and other similar liquids at flow rates up to 64 lit/min at discharge pressures up to 6.1 metres. In contrast to hand-operated pumps Finish Thompson drum pumps enable precise amounts of liquid to be transferred to smaller containers with less risk of spillage and also help to eliminate the handling problems associated with heavy containers. Tube length options start from 40 cm for smaller containers, also 70 cm, 100 cm and 120 cm for most popular sized drums and 140 cm for larger IBC’s and carboys which typically hold volumes up to 1250 litres (330 gallons). The EF series of pumps have motors which are interchangeable with any tube selection and are offered in a choice of construction materials of polypropylene and pure polypro/pure PVDF. 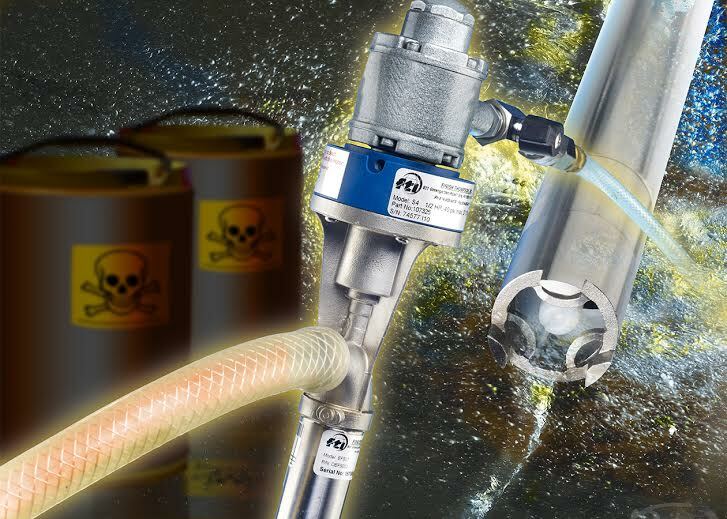 For more challenging applications, such as transferring corrosive liquids, the EFS stainless steel option is available which features a 316 SS tube and shaft. Other features include dual speed, adjustable, continuous duty electric motors, or air motors which have CSA or CE certifications and a built-in hose and cord clip for convenient storage.